Late on the evening of September 29th around a quarter of a million people in Israel’s fifth largest city, Ashdod, and surrounding areas had to scramble for cover in their safe rooms and air raid shelters as sirens warned them of an incoming missile from the Gaza Strip. Fortunately, the Iron Dome defence system was able to intercept the Grad missile and no injuries were reported. The attack was claimed by the Gaza Strip based Salafist Jihadist group ‘Sheikh Omar Hadid Brigade’ which has also taken responsibility for some of the previous missile attacks on Israeli civilians in recent months. Several hours later, Israel responded to that attack with four strikes on Hamas terrorist infrastructure in the Gaza Strip. BBC correspondents in the region were aware of the incident. However, visitors to the BBC News website’s Middle East page on the morning of September 30th did not find any stand-alone reporting concerning that missile attack on sleeping Israeli civilians in a major city well over 20 miles away from the Gaza Strip. 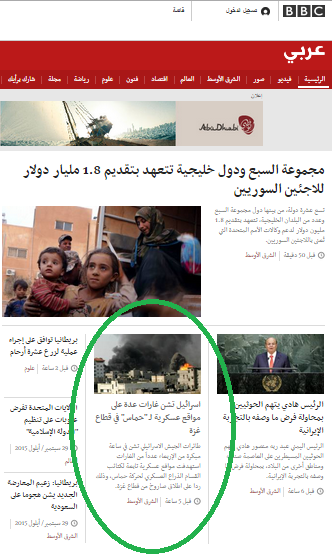 Visitors to the BBC Arabic website on the morning of September 30th found a headline informing them exclusively of the Israeli response. Whilst he article itself – “Israel launches raids on several military sites for “Hamas” in Gaza Strip” – does use the ‘last-first reporting’ technique to inform readers that the Israeli strikes came “in response to a rocket fired from the Gaza Strip”, much of its word count is devoted to description of the locations targeted in Israel’s response. Civilians in southern Israel have been subjected to three separate incidents of missile attacks from the Gaza Strip throughout the month of September 2015. The BBC’s record on reporting those attacks and the additional ones which have taken place since the end of the summer 2014 hostilities is summarised below. September 16th 2014 – mortar fire at the Eshkol region – not reported by BBC News but briefly mentioned in a later article on another topic. October 31st 2014 – missile fire at the Eshkol region – not reported by BBC News. December 19th 2014 – missile fire at the Eshkol region – not covered by BBC News at the time but Israeli response reported in English. April 23rd 2015 – missile fire at Sha’ar HaNegev region – not reported by BBC News. May 26th 2015 – missile fire at Gan Yavne area – not covered by BBC News but Israeli response reported by BBC Arabic. June 3rd 2015 – missile fire at Sdot Negev region – not covered by BBC News but Israeli response reported by BBC Arabic. June 6th 2015 – missile fire at Hof Ashkelon area – not covered by BBC News but Israeli response reported by BBC Arabic. Later briefly mentioned in a June 10th report by Yolande Knell. June 11th 2015 – missile fire (fell short in Gaza Strip) – later mentioned in a June 12th article by Yolande Knell. June 23rd 2015 – missile fire at Yad Mordechai area – not covered by BBC News but Israeli response reported by BBC Arabic. July 16th 2015 – missile fire at the Ashkelon area – not reported by the BBC in English. August 7th 2015 – missile fire at the Kissufim area – not covered by the BBC’s English language services, but Israeli response reported by BBC Arabic. August 27th 2015 – missile fire at the Eshkol area – not reported by BBC News in English, but Israeli response covered by BBC Arabic. September 18th 2015 – missile fire on Sderot and Ashkelon – 19 words of reporting in a BBC News article on a different topic. Israeli response reported by BBC Arabic. September 21st 2015 – missile fire at the Hof Ashkelon area – not reported by BBC News. September 29th 2015 – missile fire at Ashdod – 15 words of coverage in an article on another topic. 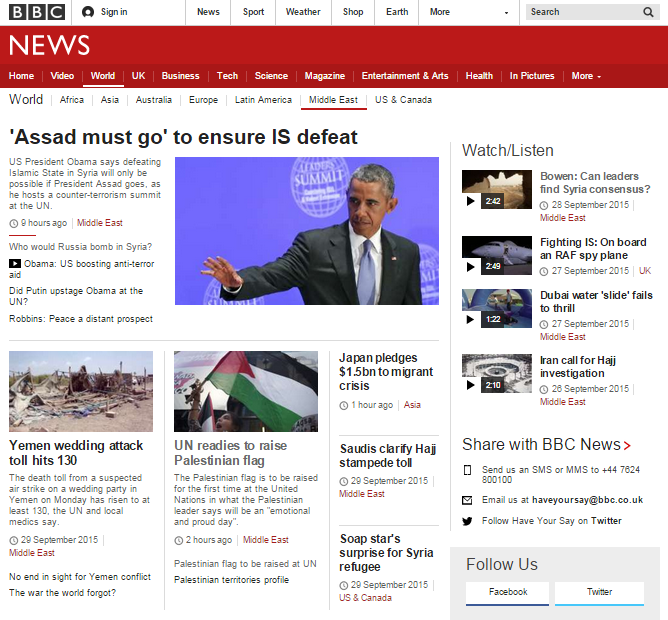 Israeli response covered by BBC Arabic. Clearly BBC audiences are not being provided with the full range of information necessary for them to “[b]uild a global understanding of international issues” and remarkably, not one BBC correspondent has found the time or inclination to venture down to southern Israel during the past year to report on the views and experiences of the civilians living under the constant threat of missile attacks by terrorists located in the Gaza Strip. Update: Later amendment to the BBC News website article which originally included fifteen words of coverage of the Grad missile attack on Ashdod September 29th removed that information.